Samlor korko is one of the most popular traditional Khmer food dishes. It means stirring soup, but it is special vegetable soup with many greenness and leaves. Local legend has it that Samlor korko has been the king’s food for a longtime and there used to be nearly hundreds of vegetables and fruits were used for cooking the King’s special soup. However, Samlor karko has been changed from the original recipe to be served in public. Typically, to make Samlor karko, you can choose any meat for cooking like fish, pork, chicken or dove. For fish the great taste is Chlang Fish & Andeang fish. Samlor karko has a great flavor if it is served hot. Cooking Samlor karko takes time because it takes a while to prepare all the vegetables as well as the Kroeung. Khmer people cook it very often though because it has a wonderful flavor. Traditionally, people can create different recipes cooking this dish with adding of different vegetables or fruits such as the young palm fruit Kandieng Leaf or Kampinring Leaf which are great. In every country in the world, it always has some beautiful sights to see. Those sights might be a statue, monument, square, temple, or cathedral. Every country is proud of them, and everyone is interested in talking about them. In my country, Cambodia has a most beautiful beach, which captures a great number of tourists all year. 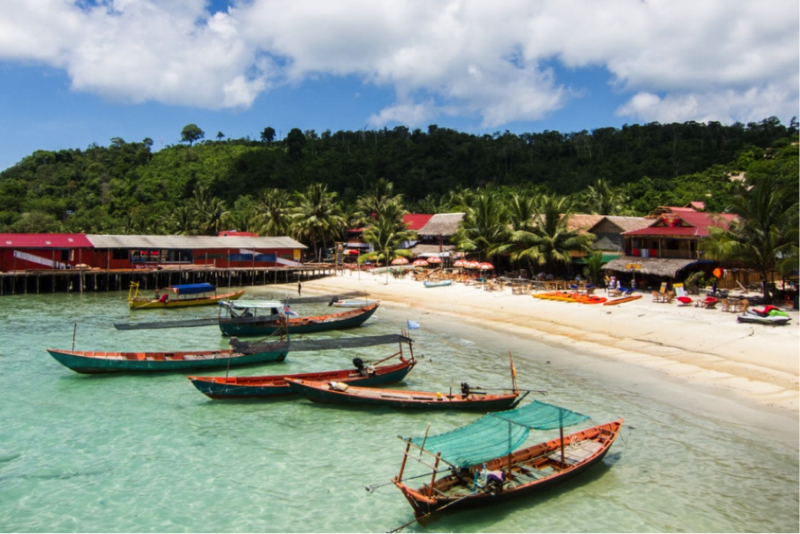 Sihanouk Ville is the best place where all the tourists may see some of the most interesting sights they will ever see as it is a port to some of the best beaches around. Well last year, my classmates and I, around 25 people, planned to go and visit Sihanouk Ville for two days. At that time, visiting Sihanouk Ville was a really new experience for us, and we hadn’t really heard much about the beaches or how beautiful and relaxing they are. It took over 5 hours by bus, driving from Phnom Penh to Sihanouk Ville. Along the way, we all felt annoyed about the paved and dirt road because it was under construction, and that caused a lot of shaking to our bodies, especially the head. But finally we arrived the hotel and had a late lunch. Everyone looked very tired, but they had time to check in and relax in the hotel for a few hours. After that, some of us decided to take a tuk tuk to go to Otres Beach and you know what? We had a problem with negotiating the price (just like a tourist, right), so we ended up walking 20 minutes from our hotel to the beach… long enough to make us exhausted. Everyone was spending the first evening at dinner, viewing the sunset, and most of us enjoyed it with drinking beer and eating some barbecue seafood, chicken, beef and pork too. 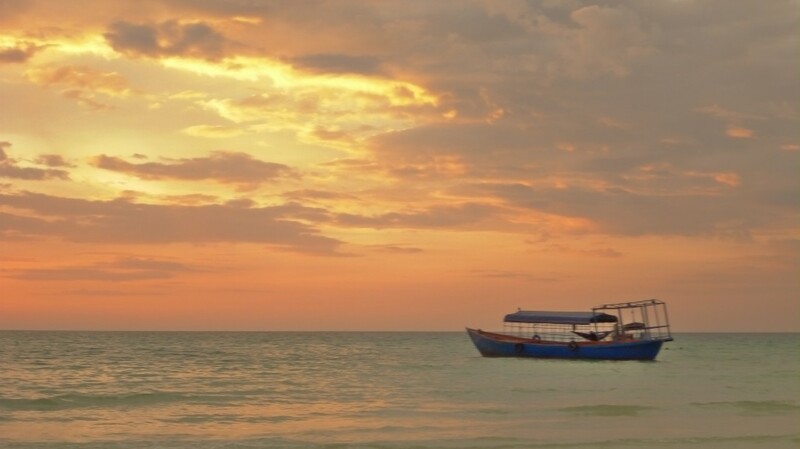 The next morning, we got up with a beautiful sunrise and arranged a boat to visit Koh Rong. It took about 2 hours to get to the island. While riding the boat, everyone was so amazed by the views on the water. During the trip we also had some people play guitar while we sang together. After lunch on Koh Rong, people played some volleyball, others went fishing, and some others rented canoes to race. We spent the entire day doing fun activities and playing in the water. It was relaxing and wonderful. With all of the amazing memories made there, it is no wonder many tourists choose Sihanouk Ville as the place to spend their holiday and explore the great beaches and have an adventure. More tourists should consider going, it would be a wise decision to visit there! 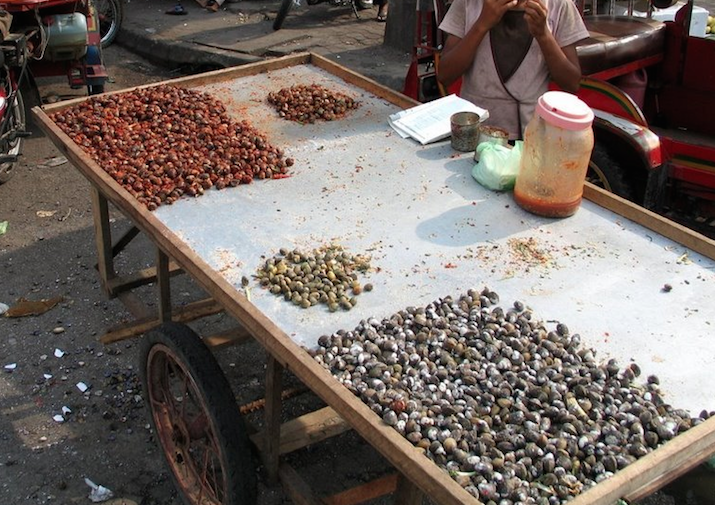 Clams are a kind of snack food here in Cambodia. Everyone here likes to eat clams with spices and more so with sausage, but that is more for a meal. Generally, we can buy them from sellers who use carts to sell their clams. There are four flavors that can be easily found for street clams – plain (normal) clams, salt clams, spicy-chili clams and spicy-lemon clams. The spicy ones are best. Cart sellers sell one can of clams for about 1500 riel. 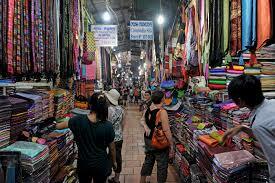 They can be found easily by the markets, like Central Market in Phnom Penh or down big streets. People tend to buy a can or two and bite them open and drop the shells on the street. They should be eaten it when the weather is hot because then the clams’ meat will be cooked. If they are eaten when the clams are still cool or have a strong smell, it will make people have a bad stomach. 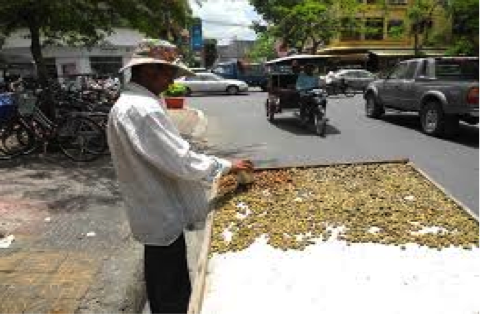 Clams are easy to find in the river or tributary here in Cambodia. They are easy to make too. 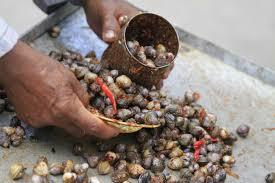 Just buy freshwater clams or catch them from the river and put into boiling water. You can take them out immediately cause clams don’t have blood so it is easy and fast to cook. Then just mix some ingredients like salt, chili or spicy lemon to make them delicious. After that, take them to dry under the sun until it hot enough (about 15 minutes) than you can eat. 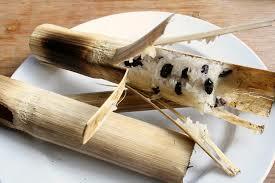 Kralan is a snack that is made from Cambodia sticky rice cooked with coconut milk and soybean in a bamboo tube. 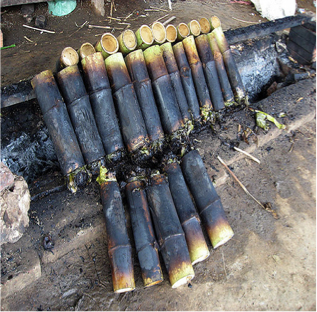 Kralan is very popular for Cambodian people as well as for foreigners. We can find it everywhere in Cambodia, but especially in the province and it is a bit harder to find in Phnom Penh city. Now, there are some sellers who come from the provinces to sell it in the city, but they cost higher than in the provinces. A tube of kralan cost about 2,000 to 4,000 riels, depending on the size. The most delicious kralan comes from the Kratie province and it is hard to get one tube of the sweet snack in Phnom Penh. Here are the steps on how to make it. First, we have to have all the ingredients like sticky rice, soy bean, coconut milk, sugar and salt. We have to soak the sticky rice and soybean for 2 hours then wash it with cleaned water. 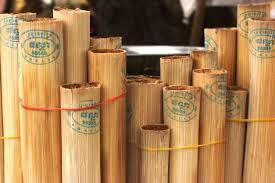 Secondly, take the bamboo tree to cut into pieces at it joints, so the tube has only one way out to put the rice. Then take the tube and clean it with water. The bamboo tree must be the bamboos that grow in village because it has long tubes, contains a lot of water and has white flesh inside the tube. Third, take the sticky rice and soybean and mix together with a little salt and sugar. Next, we have to put it into the tube and stuff it tight. If it is not tight, the kralan will become muddy. Then cover the tube surface with coconut hast or banana leaves – stuff these tight at the top. Last step, we have to take all the tubes that are filled with the sticky rice and ingredients to burn where the coals are spread in a long line. There is a shelf in the middle that the bamboo tubes are placed on at both side of the fire. All sides of the tubes must face the fire, so it is well cooked. It takes about 35 to 50 minutes because we cannot use too strong of a fire. After it is well cooked, take it to be cooled and then remove the outer layer of the tubes, which were burned. Finally, the Kralan is done and ready to eat! Sometimes If we are let out early from class for lunch and don’t know where to go we go to a food court. 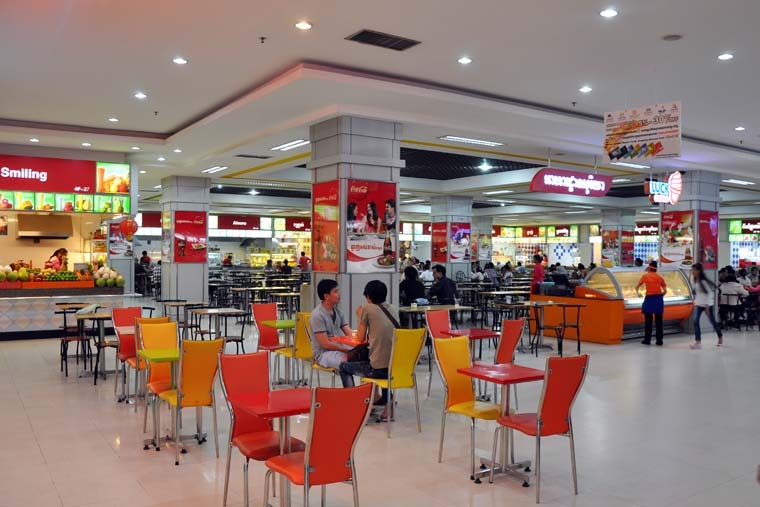 People should try the Sorya Mall food court – it’s the place I’d like to recommend. The price is suitable 8,000 to 16,000 riel (2-4$) and there are a lot of tables and chairs to choose to sit, though sometimes it can get crowded. There are all kinds of foods that are waiting for people to grab it. There is Thai food, Vietnamese food, Chinese food, Korean food, and food from Italy. How to get the food is by first deciding what you want after taking a look around and then take your money to the counter – across from the food stalls – and change it with one of the cards. For example I would change my money 20,000 riel (5 dollars) to get a card that has 5 dollars on it. Then you can take the card and purchase all kind of food and soft drinks up at the food counters. By using a card it makes it easy for people not to use the same hand to grab money and food at the same time. After you are done eating, left over money on the card can be retrieved by returning the card to the counter. But don’t forget about desserts. The desserts are also what should not be missed – like sweet taro and banana are famous desserts here in Cambodia, among many others. If you haven’t tasted them you should go now. I recommend to the people in the city to try the food up there in Sorya Mall, its good, fast, and easy to get. I was born into a traditional family. My father works at one of the ministries and my mother is a seller at Russian Market (Toul Tom Poung Market). I was at the market when I was little; I would say my second home is in the shop. I helped my mom at the shop since I was a small kid, until I became an adult. 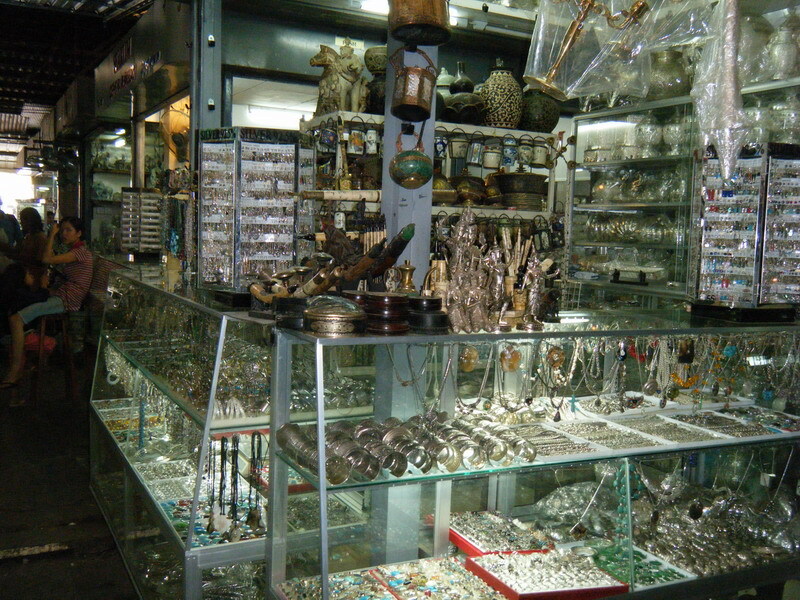 My mom’s shop is smaller than others and we sell all kinds of handmade jewelry. Right now, I want to share with you, the best things that tourists and buyers say to ask for a discount. As a buyer, they not only want the best service and quality, but also want the best price, which is a discounted price. I was faced with this situation many times since I was young, and it still happens all the time between sellers and buyers. At my mom’s shop we mostly have more tourist customers. If they walk-in and looking for a gift for their relatives in the morning almost 70% do not ask or say: “we are your first customer, so you should give us the good price.” or “We will bring you more customers and our tour-team to buy from you lots because your shop gives us the good price.” They should say this. 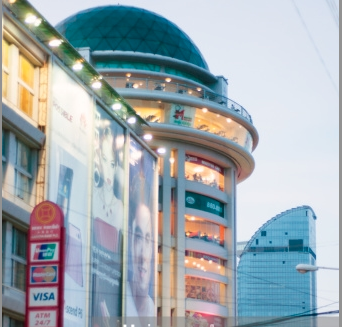 However, in market there is not only one kind of customer, it also has customers who tell seller that they live in Cambodia three or four years (expats) so they know clearly about the price. In fact, this it is the hints to let seller know and will give them a discount and not cut them the high price. The last types of customers are those who have a friend who usually comes to purchase at shop regularly. They just mention their friend’s name and the seller will definitely give them a good price when seller knows who they are. So when you come to visit my shop and other shops in the markets – don’t forget to use these tips to ask for a discount. I’m sure I will give the best price ever that no other shop could give, just need to ask nicely. Traditional Khmer Food – AMOK! AMOK is known as the most traditional dish of Cambodia. It is also known as “Steamed Curry Fish” or “AMOK Trei”. It is very famous for local people and for foreigners who want to taste Cambodian traditional cuisine. 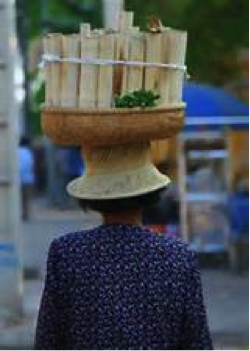 If you visit Cambodian restaurants, you may ask for a recommendation from the waitress or waiter. 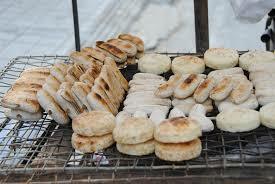 Almost ninety percent of them will recommend you to order AMOK since it is one of the most famous dishes in Cambodia. The ways that Cambodian people cook AMOK are not always the same. They have different ways to cook it in term of how they wrap the banana leaves with it. Normally, we use fish to cook Amok, however, we can use other meats like chicken, beef, and seafood (shrimp). Another secret ingredient is the aromatic mixture of Khmer Yellow Kroeung. Most people want to know why AMOK became so famous for foreigners. The reason is that AMOK is represented as Cambodian main dish. 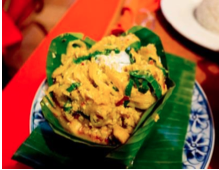 First, AMOK uses banana leaves instead of using plate; and banana is the Cambodian fruit. Cambodian people use a lot of banana leaves in many other food like for dessert (Khmer Sticky Rice-use banana leaves to wrap). Moreover, they even use the banana tree to make soup as well like Khmer sour soup “Morju Derm Jeck”. On the other hand, we have another ways to wrap AMOK. We can use coconut, snail shell, and plate instead of using banana leaves. Secondly, AMOK’s main ingredient is Cambodian freshwater fish. Cambodia has a large lake in the middle of the country and because of this enormous lake, Cambodian people have a ton of fish to eat and sell in both rainy and dry season. Moreover, Cambodian fish is tasty. 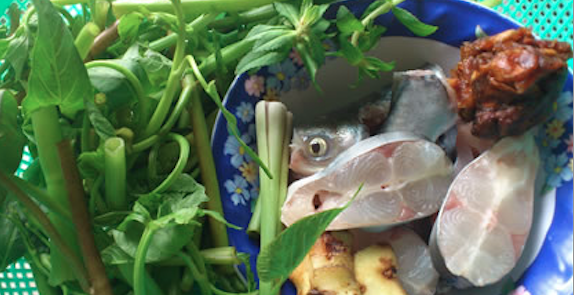 In AMOK, we use Snakehead fish “Trei Ros”. When people see this fish, they know that it is from Cambodia. Lastly, AMOK uses the fresh and tasty ingredients. Those ingredients represent as Cambodian cuisine as well. In short, AMOK is the famous national dish of Cambodia because of its rich spicy combination of freshwater fish and fresh ingredients, it makes this dish become the soul of Khmer cuisine. 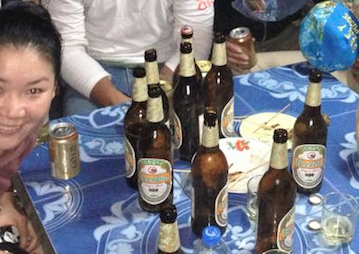 Normally, Cambodian people usually cook Amok when they have a family party. The reason is that it has a lot of fun when we cook it; and to cook this dish, it demands the help from all family members. Apart from this, AMOK is also the main dish during Cambodian festivals like Water Festival, which celebrates to thank to Mekong River for providing Cambodian people with fertilized land and abundant fish. Firstly, we need to prepare those fresh ingredients including meat “Snakehead fish”, coconut milk, dried red chilies, Kaffir lime skin, lemongrass, garlic, egg, roasted crushed peanuts, shrimp paste, banana leaves, shallots, galangal, Krachai, turmeric, cilantro, Noni leaves, and red pepper. Secondly, it takes time to cook. We need to clean the fish first by using lemon and salt because they help to reduce the fishy smell and make the fish look fresh and clean. Cut the banana leaves into circles and make them look like a boat or box by folding the sides in and securing them with toothpicks. Mix dried red chilies, Kaffir lime skin, lemongrass, garlic, shallots, galangal, Krachai, turmeric together and put a little amount of shrimp paste into it; this is called Yellow Kroeung. Next cut red pepper into a flower shape, which we use to decorate the top of the AMOK. Then put the coconut milk and powder into a hotpot and mix them together. After, put the fish, Yellow Kroeung, egg, roasted crushed peanuts into the pot. Add a little bit of fish sauce, salt, sugar palm, chicken powder and then mix them together for fifteen minutes. Next, put Noni leaves on the bottom of banana leaves that has a shape like a boat. Put the AMOK into it and steam it. When the AMOK is cooked, we put the coconut milk on top of it, and put some cilantro and red pepper on top. Lastly, prepare the rice and we are ready to eat. This blog is set up to be a collection of ideas and thoughts from Cambodian students at the National University of Management in Phnom Penh. Topics are going to vary, from cool local spots to best places to buy a cell phone to daily life for a university student. If there are any topics a reader would like to know about or ask a question – email or leave a comment and we will try our best to answer it!